Rufus is an easy to use portable software program for Microsoft Windows devices to create bootable USB drives using ISO images. It appears that I have never reviewed Rufus before here on Ghacks, even though I mentioned it a couple of times in the past when it came to the creation of bootable USB media. Bootable USB media is quite common these days, as more and more PCs and laptops seem to ship without optical drive. There are plenty of programs for the job; Microsoft's own Windows Media Creation Tool supports it, and so do tools like Linux Live USB Creator, LiLi, XBOOT, Windows Bootable Image Creator, and RMPrepUSB. Update: Rufus 3.0 has been released. The new version changes the interface slightly, adds some new features and improvements, and drops Windows XP and Vista support. Rufus is one of the easier programs for the job. You can use it to format USB drives without making them bootable at all. Launch the program after download and archive extraction. It displays all of its options directly, making it easy to configure them to your liking. The most important one is the "create a bootable disk using" option under format options in the lower half of the interface. You need to specify an ISO image for that. Click on the browse button next to the option, and use the local file browser to pick an ISO stored on it. You may then modify other settings to your liking. Most are fine however for most use cases, but you can change the volume label for instance, enable disk check to check for bad blocks on the USB drive, or disable quick format. 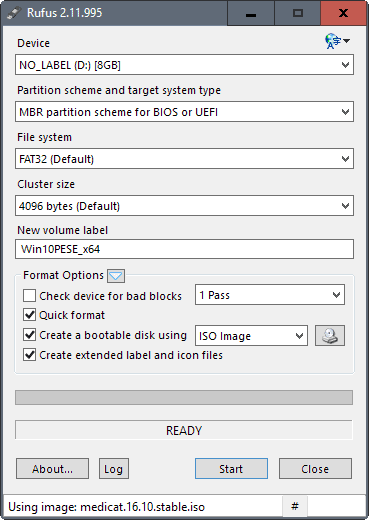 Advanced options let you change the cluster size and file system, and the partition scheme. That's all there is to it. Rufus may display additional options if it identifies the image correctly. If you select a Windows installation ISO for instance, you may get the option to create a standard Windows installation disk, or setup Windows to Go. Note: The selected device will be formatted during the process. All content that is on it is lost therefore. Make sure you have backed up important data before you proceed. To avoid issues, only removable drives are listed under device so that you cannot accidentally format one of the fixed drives. Once you have made the necessary changes click on the start button to start the process. Rufus will check the image and compare it to the available disk size. You may get a notification that it is too big for the USB device. The program displays a warning prompt to inform you that all data on the disk will be deleted in the process. Click on okay to continue, or cancel to stop the process and return to the main interface of the program. The process itself does not take too long; it depends on the size of the ISO, and the speed of the USB drive mainly. Rufus is a handy program that is ideal for any troubleshooting toolkit. It is lightweight, portable, and turns any ISO image into a bootable USB drive in a matter of minutes. Now You: Which program do you use to create bootable USB drives? Love the tool, but Rufus doesn’t offer an option to create “persistence” on a USB for any of the Ubuntu based distros which, for me, is a severe limitation. The developer says he won’t ever include the option for persistent storage–the last I read. Kind of too bad. It’s freeware. Like Rufus, it only has one small screen. The download used to be a simple portable thing, now they’ve gone with a windows installer… No need for that, IMO, so I switched to Rufus portable. They both work. Simple small utilities. Yeah, I use this thing all the time, and its great. Its so small, it does what its supposed to, there are no ads, and no installation process. I use YUMI for a while now , might worth a review ? ..on a side note : for my very first post here, I would like to congrats Mr Brinkmann for this great GHACKS blog , I drop by almost daily for about a year and a half now , always something of interest here !! You made me discover great tools and infos !! All in all : Keep up the good work Martin !! I really like using ISOtoUSB to make bootable flash drives. I agree Rufus is a great free tool. You don’t need Rufus to create a Persistence Linux Distro. I use this fantastic free tool… PenDriveLinux Universal-Usb-Installer…V1.9.7.0. I have used it to make a Usb Portable Linux Lite 3.2. It does not require installation. Right, I was only making a comment on Rufus. I rarely use it because there are too many other tools to use that will allow a “persistence” file to be made in the process. PDL even has a tool to create the casper rw “persistent” file which can then be added to Linux distro made with Rufus. Then, one can play around with the boot code, add persistence, and all is fine. It’s just Rufus wouldn’t be my first choice for making a persistent Linux USB. For making a Windows USB, the speed with which Rufus works is amazing. Found Rufus to be good at formatting a stubborn USB when the HP tool doesn’t work. Of course, a different distro can make a difference because persistence is built in–say Puppy Linux or Porteus. I no need any non cross platform soft for creating bootable usb from iso. Rufus is the cut the crap kind of software that does exactly what its described to do. Simple as that. However Rufus is not capable of flashing bsd images. In rare cases some might work. In most cases they require win32diskimager to do the job. I started using Rufus when laptops started requiring UEFI bootable devices. I currently use it for updating to the latest Windows 10 versions, so that I don’t have to download it on every computer of mine. I used to use iso2disc to make bootable usb.